Time management is one of those dirty secrets about the VA business. Very few Virtual Assistants will admit publicly that they have a problem with time management, but talk to us off the record and you’ll often find that we’re experiencing conflicts between our work and personal lives, that we often feel drained and exhausted at the end of a working week or even midway through one, and that we know we’re not growing our businesses because we don’t get enough time to work on development – we’re too busy keeping all the balls in the air! So, given that a VA exists to free up time for somebody else, why are we rather rubbish at time management for ourselves? Admitting failure is too difficult – a business that helps other businesses can’t ask for help … as a result we just refuse to face reality. 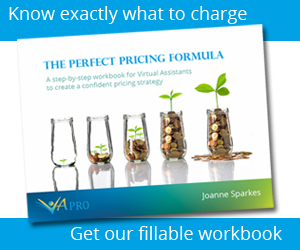 The first year or 18 months of a VA business is probably when patterns are established – poor time management now will lead to constant stress, cramming in too much, doing poorly-paying and time-consuming work instead of focusing on quality leads and contracts all resulting in general exhaustion: physically, emotionally and probably financially! Decide how long your working week will be. If it’s forty hours, stick to it. If you want a three hour lunch break, say so. Train your clients to know your hours. Train yourself to stick to them too. If you don’t – why should anybody else? In addition, schedule time to build your business, even if it’s only a couple of hours a week. The best time to look for new clients is when you don’t need them. It’s also the best way to keep from over-investing in current clients and giving them time that should be spent at home or on your personal development. Developing yourself, whether it’s your professional skills, your hobbies or your social network is the best way to ensure you’re a success on many levels. It also helps build resilience into your life. List your tasks in three categories: business, home and personal. Personal should include all the things that make your life worthwhile, whether it’s running a marathon or having a pedicure or just getting a couple of hours a week to read a novel. Graphs and pie charts are a fantastic way to look at your work/life balance and may shock you! When you’ve got those tasks listed, relist them in order of importance. Now you’re in a position to decide which ones you must do (they will usually be on the personal or home list) and which ones could be delegated or automated. Online shopping, laundry services, hiring a cook to fill your freezer with great meals are all as possible as outsourcing data crunching or installing an answering service for out of hours calls. Don’t think delegation ends when working hours end. Devise accountability systems that tell you when tasks have been completed. This means creating systems that measure work, home and personal tasks and note what got done and what didn’t. Then it’s time to apply one of the other tools to solve the problem of regularly uncompleted jobs. I’m going to bet you right now that it’s the personal tasks that will be most neglected! Avoid procrastination – it doesn’t help ever, anywhere. If you get to the point where you’re procrastinating, there’s a problem in your work/life balance – that’s a warning sign that you need to address. Use technology – automate, don’t procrastinate. Use every kind of technology possible to simplify and streamline both your working and home lives and then use that same technology to ensure you prioritise your personal tasks – schedulers for massages, manicures and pop-up reminders that a fascinating new film premières this week, will help you invest in you. Declutter – few of us work well in a mess. Delegate your mess to others and teach your family that mess goes missing. Hold a monthly sweep in which you remove all the things that aren’t in the right place. Institute a forfeit system where ‘swept’ items are only returned after a penalty has been paid: lawn-mowing, bedroom tidying etc work well for family members as forfeits. Give somebody else authority to do the same for your stuff – it’s a harsh lesson but it works and very soon you’ll all be living in a more organised and serene environment.